Childhood melodies have a way of staying with us long years after we first hear them. Children, naturally, are less concerned with the singer than with the song. The only reason that I associated Nanda Malini with the voice and the melodies that were sent rippling along the air ways by what was then the Ceylon Broadcasting Corporation, is because my grandfather, for reasons best known to him, didnt like her and said so on more than one occasion. At that time I couldnt understand his objection, for I immediately took a liking to songs such as Buddhanu Bhavena and Mal Mal Heenaya. My growing up was accompanied in many ways by her two popular concerts, Satyaye Geethaya (the song of truth) and Pavana (wind). In fact it is probably true that the political maturing of my generation, especially its rural and non-English speaking sections, owes much to Nanda Malini and her commitment to the belief that the song has a social purpose. While the oldest in the family attended St. Benedicts College, Nanda and five others, due to economic hardships, had their early education at Gunananda Vidyala. The youngest two had gone to Kumara Vidyalaya. Gunananda Vidyalaya was an isolated nondescript school, surrounded by Christian schools. According to Nanda, it had very poor facilities. "Still, it was a place where arts-related activities were valued. Every other Wednesday, we had a samithiya where the students got the opportunity to display their creative talents. We got by with what we had. I remember Victor Wickramage, who later became very well known in the fields of nadagam and nurthi providing the rhythm by drumming on a desk. I was often called upon to sing kavi and soon this became an invariable item at our Wednesday cultural gatherings. In fact I won a gold medal for our school at a padya gayana competition held at the Borella YMBA in 1956." Nanda noted with gratitude the encouragement given her by her class teacher, N. Margaret Perera. "She had a kind of a third eye and she was able to guage my potential as a singer. She took me to the Broadcasting Corporation and got me involved with the Lama Mandapaya. There I met people like Sarath Wimalaweera and Karunaratne Abeysekera. Things were much more formal then, there being no auditions to select people. Still there was discipline. I had to wait for two years before I was allowed to perform by myself. Before that I would sing in a chorus or read a letter sent by a listener." At that time everything was done "live". The first song that Nanda recorded was Budu sadhu, written by Asoka Colombage and set to music by D. D. Danny. Although the upper age limit for the childrens programme was 16, Nanda, because she looked young, stayed on until she was 18 or so. She said she got to know a lot of people and that she learnt a lot during those years. It was through this programme that she got to know and learn from W. D. Amaradeva. It was Amaradeva who had picked her to sing in the first film where he handled the music direction, Ranmuthuduwa, in 1963. Nanda considers this the most fortuitous moment in her singing career. It was the first Sinhala colour film. The song, Galana Gangaki Jeevithe, which she sang with Narada Disasekera, was the first song that Chandraratne Manawasinghe had written for the screen. Ranmuthuduwa was also the first film produced by Serendib. The film had swept all the Sarasavi awards for music that year, including best lyrics, best music direction, best singer (female and male). Since then Nanda has sung in many films and has secured 11 Sarasavi awards, 8 Presidential awards and has been adjudged the most popular female vocalist from 1995-98. Although there have been many singers who have taken up political issues in their work, Nanda Malini is clearly the foremost exponent of the political song in this country. She said that as her understanding of things and processes grew, she began to wonder if music was only about pleasing the ear. "A slogan was slowly forming in my mind. It said the song has a social purpose to fulfill." The SLBC refused to air songs like Sukiribatillange Geethaya and Sakura Mal. Whereas the political message in some of these "banned" songs was carefully and one could say more aesthetically crafted, by the time she came out with Pavana, it virtually oozed out of the lyrics. The Pavana concert hit our conscience in the late eighties, when the country was on the brink of the bheeshanaya. It was immensely popular, especially among the youth. I put it to Nanda that for some reason those songs did not register in our beings in the same way that those of her first two concerts Shravanaradana and Satyaye Gethaya had. "The social conditions of that time compelled us to come out with pavana. If we hadnt done it, we would have had to ask ourselves what our purpose in singing was. I did say that those songs were valid only for that time and the people were free to throw them away if they so desired. But I believe that those issues have not gone away. They are still with us, and so the songs too are still valid. It is becoming clear that we are fast proceeding down the same path of destruction that we had to suffer in the late eighties." Over a period of almost 30 years, Nanda Malini has produced twenty five cassettes. Her latest, Sari Podiththak, which is to be released shortly, includes songs which were recorded by the SLBC in the seventies where she herself had composed the music. She said that cassettes had become her main medium, partly because things have changed in the SLBC to the extent that people have begun to wonder if the SLBC had a music department. I come out with a new cassette every year. Here I must mention the help afforded by Singlanka Company. They never imposed conditions not interfered with the production. A lot of hard work and research goes into this exercise. In fact, I take about two months off after releasing a new piece because it is exhausting. Even for my latest cassette I spent a lot of time at the SLBC music library recording my early songs because I wanted to be faithful to the music when the final recording was done." "These cassettes were not just random collections of songs. Each had a purpose. For example, I realised that there were many talented young writers in our country and they needed some exposure. I requested young people to send me their best creative work and got a respected panel to select the best. The result was Araliya Landata. Similarly, Malata Renu includes original tunes composed by unknown artists. A lot of young people benefitted from these exercises. Tamil folk songs, which aimed at driving the point that the Tamil people are not the savages they are often made out to be. Kirimaduwel was a celebration of Sinhala folk poetry." I put it to her that all these exercises are as political as her effort in Pavana, with the difference that they appeal to the more reflective elements within us and as such are more nurturing, and that while we all enjoyed Pavana, not all of us had the political maturity nor the discipline to distill the appropriate line of action from the words. She laughed and observed that I was criticising her relentlessly, but acknowledged that a lot of people tell her that. 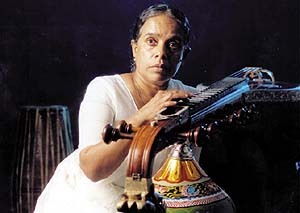 Looking back, Nanda Malini said that the person who had inspired and helped her most in her music life had been Pundit Amaradeva. "I picked up many things from him. He taught me how to infuse power into the word," she said. She also acknowledged the massive contribution of Sunil Ariyaratne. "He has written about 75% of the lyrics of my songs, beginning with Sakura Mal, which was his first song and the first song to which I put the melody. Then there were many music directors whose support was invaluable. They include Somadasa Elvitigala, Premasiri Khemadasa, D. R. Peiris, Lionel Algama, Shelton Premaratne among others. Then of course the song writers, such as Mahagamasekera, Chandraratne Manawasinghe, Dalton Alwis, Fr. Jayakody, Sarachchandra and Madawala Ratnayake. All these people were giants in their fields. It was a privilege to associate with them. It is from them that I acquired the ability to discern between the good and the exceptional in literature." Nanda Malini is not just a singer, she is a teacher. She has around 400 students in her music academy, sangeetha ashram. "For children between 8 and 12, it is only voice training. Those who are between 12 and 15 concentrate more on music as a subject in their school curriculum. Those who are older are prepared for the Visharada exams." She is also a student, always experimenting, ever willing to learn new things. Right now she is studying western music. "There is a lot that we can learn from other schools of music. This is not to say that we have to become more western. There is nothing wrong in taking what is good in the west, as long as we dont compromise our identity or forget who we are." We live in a nation where you can be guaranteed that if you do a quick run through all the radio stations the chances are that almost all the songs will be about love, i.e. nothing too different from the perennial themes, "I love you, you love me, how nice!" or "I love you, why dont you love me?" or the inevitable complaint, "you dont love me anymore!" If all poetry and all literature in fact followed the same themes, we would be quite poor as a nation, for love, especially romantic love, constitutes only one element of the human condition and its multi-faceted concerns. It is in this context that one song from pawana comes to my mind.